Before there were films, there were books. And in fact, before there were good films, good books usually proceeded them. Throughout the month of September, I’ll be paying tribute to my favorite literary adaptations in cinema. I know my readers must think I spend most of my time watching movies and drinking cocktails, and while those activities are certainly a part of my weekly routine, most of my spare time is actually spent reading. Because I consider myself first and foremost a lover of books, it pains me to see filmmakers get a literary adaptation wrong (I’m looking at you Simon Birch!). Conversely, when they get it right, it can be pretty magical (hip hip hooray The Door in the Floor!). Although there have been a lot of contemporary adaptations lately, I’m adhering to the classics this month. School just started again, so if you’re stuck explaining Jane Austen or Charles Dickens to your middle or high-school age child, don’t worry- Cinema Sips to the rescue! This week I’ll be watching my favorite Jane Austen adaptation, Sense and Sensibility (DVD/Download). I am a functioning, breathing female, so yes, I love all things Austen. I even love all things about loving all things Austen (ie. the wonderfully charming film Austenland). By far I think Sense & Sensibility does the best job of depicting a classic Austen tale featuring two unlucky-in-love sisters- one pragmatic, the other a dreamer. Emma Thompson’s screenplay perfectly captures the rich language of Austen’s novel, while making it understandable to modern audiences. The cast is superb, featuring Emma Thompson, Kate Winslet, Hugh Grant, Alan Rickman, and Hugh Laurie, along with the usual cavalcade of minor British character actors who seem to be in every film coming out of the UK. It was an unusual choice to hire Ang Lee as the director, but he fills the movie with so many simple, quiet moments and beautiful costumes and scenery that one feels almost transported to Austen’s world. 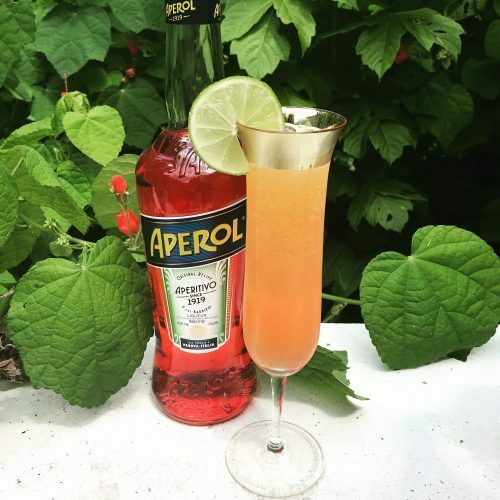 Because the Dashwood sisters are forced into simple country living upon the death of their father, I decided to choose a British cocktail that evokes summertime country flavors. I can almost picture one of the Dashwood sisters getting her dress caught in a bramble bush, relying on Willoughby or Edward to come rescue her. While watching Sense and Sensibility, I recommend drinking a Gin Bramble. Combine gin, lemon juice, and simple syrup in a shaker, shake until well mixed, then pour into a tumbler or mason jar filled with crushed ice. 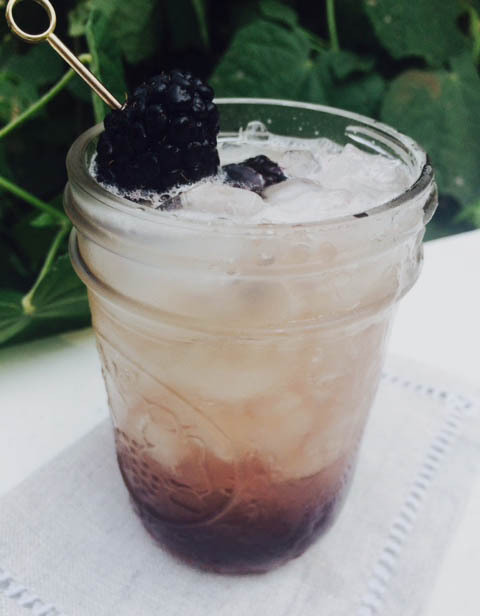 Drizzle blackberry liqueur over the top, and garnish with a fresh blackberry. 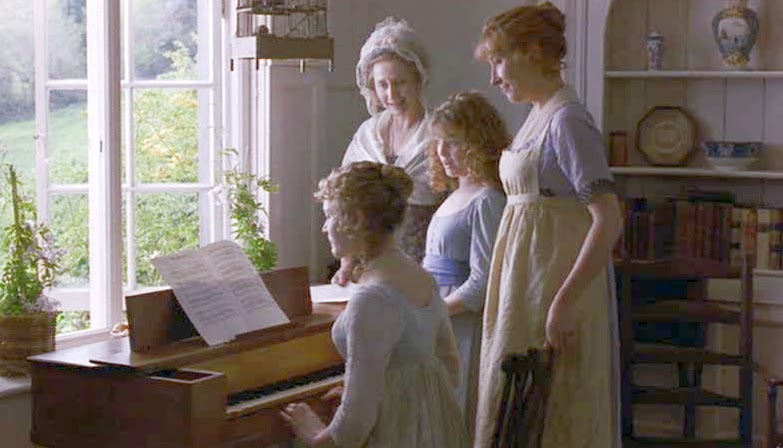 My favorite part in Sense and Sensibility is when Colonel Brandon (Alan Rickman) sees Marianne Dashwood (Kate Winslet) for the first time as she’s singing a song at the piano. He enters the room, and you can just see the waves of attraction and obsession wash over him. It’s moments like this that make the film a wonderful complement to the words on the page, and a rare case of a screen reality being even better than my imagination. Cheers! Posted in Dramas and tagged Alan Rickman, Austenland, Emma Thompson, Gin Bramble, Hugh Grant, Hugh Laurie, Jane Austen film adaptations, Kate Winslet, Literary Adaptations, movie cocktails, Sense and Sensibility. Bookmark the permalink.